She’s younger than me. By a lot. She gets away with critiquing others this way. She was right. My little sister was right. My snotty, 20-something, non-home-owning sister was right. My entry door was way outdated. Luckily, my snotty, 20-something, non-home-owning sister is also resourceful. She stuck her nose in her cell phone for less than ten minutes and then began telling me all about this door and window installation company nearby called Brock Doors and Windows. “They’ve got really good reviews online,” she said. Again, she was right. They have great reviews and decades of experience. For fun, we jumped in my car and drove over to Brock to check out the showroom. Wow. I was in entry door heaven. In 30 minutes, my sister and picked out the cutest entry door for my house and scheduled an installation. It’s yellow—my favorite, happy color. The pull and knocker are brushed nickel and the glass is glazed for UV protection. If you live in the GTA, Brock is excellent. Don’t just take it from me, stick your nose in your phone for ten minutes and check out their reviews online. The professionals there are wonderful, and they know how to help you pick the perfect entry door for your style home. This was another “kind critique” from my sister—my plants just didn’t go with my outdated door, nor will they look right with my new one. Once my new yellow entry door is installed, I’ll be planting happy, yellow pansies and daisies in the pots on either side of my door. See the tie-in? Cute, right? Consider getting your plants/flowers on the same page and complementary colour as your new door. I’m proud to say, this was my idea. Sort of. Ok, I stole the idea off of Pinterest, but at least my snotty (but helpful) sister can’t claim this part. There are seriously as many door number styles as there are doors to choose from! I chose oversized, brushed nickel numbers to place directly beneath the door window, centered. They’re going to be a nice touch! Now, my home says “welcome” to my guests. And, to my sister. Props to her for helping me add life to my entryway! 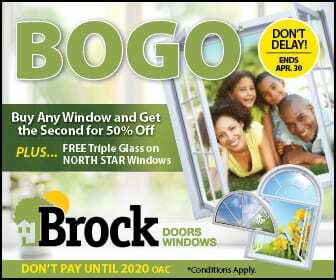 Go visit Brock Doors and Windows. You’ll love your new entry door! 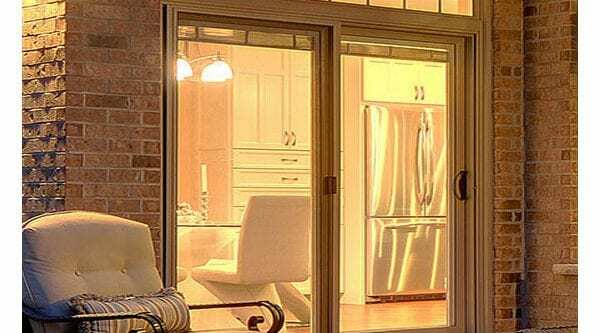 Brock Doors and Windows is a full-service door and window installation Toronto company that provides the residents of the Greater Toronto area with quality replacements and new installations that will last a lifetime. Come and visit our state of the art showroom or give us a call, today!